Physical characteristics: Adult body length is 5.9 inches (15 centimeters). Outside the breeding season, the male and female are similarly colored, yellow-brown with dark streaks on the upper body, off-white below. During the breeding season, the male has a yellow crown and breast, the upper body dark brown with yellow streaks, and off-white under parts. Geographic range: India and Sri Lanka through southwestern China, Singapore, Sumatra, and Java. 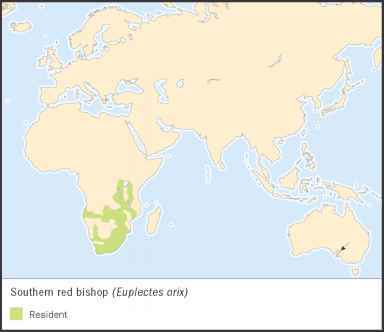 Habitat: Baya weavers live in grassland, scrub, secondary forest, farmed areas, usually near fresh or brackish water. Diet: These weavers eat mainly seeds of guinea grass, Panicum maximum. Behavior and reproduction: Males change to brighter plumage during the mating season and start building nests to attract females. Nests, one per breeding female, are built in trees, sometimes alongside hornet nests or aggressive, stinging red ants. In these cases, each species lives in peace with one another, and both gain protection from predators specific to each species. Each nest is shaped more or less like a vase, constricted in the middle and with an entrance at the bottom. It may hang by a long rope from a tree branch or be directly attached to the branch. The baya weavers build their nests out of sectioned blades of guinea grass, the seeds of which are their main food staple. The male usually assembles several partially built nests that look like domes with hanging straps, then sings and displays on the unfinished nests to attract females. An interested female will inspect one of these nests carefully. If it suits her, she displays approval and mates, after which either the male or female completes the nest. As soon as the female is busy tending the eggs, the male starts singing and displaying for females on another half-built nest, eventually taking in and mating with as many as three females. 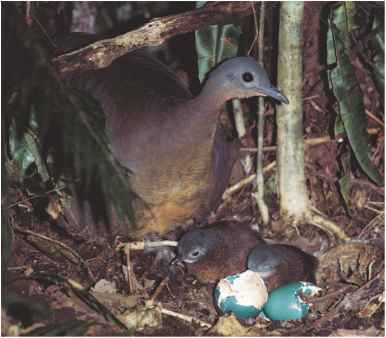 A female lays three or four eggs and must care for the chicks alone. 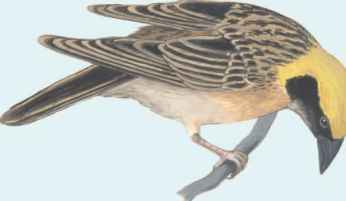 Baya weavers and people: Baya weavers have earned reputations as pests by raiding rice fields. Consequently, the birds often end up as food for humans.